Protection of environment has become a major part of international law. 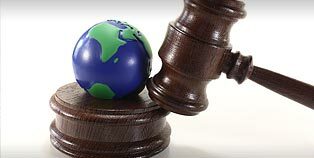 International environmental law is developed between sovereign states to develop standards at the international level and provide obligation for state including their behaviour in international environmental matters. International law is created by collective actions of nearly 200 countries around the word, which is not governed by a single international body or an institution. The framework of international environmental law had taken form of treaties, conventions, protocols etc. These are legally binding agreements among many countries for united action to tackle environmental problems. By the end of 1930s and 1940s, states had recognized the importance of conserving natural resources and negotiated several agreements to protect fauna and flora. These include 1933 London Convention on Preservation of Fauna and Flora in Their Natural State (focused primarily on Africa), and the 1940 Washington Convention on Nature Protection and Wild Life Preservation (focused on the Western Hemisphere). In the early twentieth century, the development of the modern whaling industry, through steam engines and exploding harpoon guns, led whale populations almost to the brink of extinction. In 1946, the International Convention for the Regulation of Whaling (ICRW) was created to oversee management of the whaling industry worldwide and to provide for the conservation of whales. Other conventions concerned with ocean fisheries and birds were also negotiated. During the 1950s and early 1960s, the international community was concerned with nuclear damage from civilian use (a by-product of the Atoms for Peace Proposal) and marine pollution from oil. Thus, countries negotiated agreements governing international liability for nuclear damage and required measures to prevent oil pollution at sea. Conventions were negotiated relating to interventions in case of oil pollution casualties, to civil liability for oil pollution damage, and to oil pollution control in the North Sea. Also, in between 1930 and 1960, there was a sharp rise in scientific publication on natural resources, endangered species and climate. The term “environment” emerged in early 1960s. Soon after, common concern about the need for global action for the protection of natural environment increased due to public awareness on the state of environment, change in political consciousness of the environment, development of scientific knowledge and technologies, dissemination of knowledge and change in international legal system. Public awareness on environmental impacts increased tremendously soon after the release of Rachel Carson’s book “Salient Spring”, which focused on the impact of pesticides such as DDT on human and ecosystem. Then, the Tory Canyon oil disaster occurred in 1967. During 1970s new technologies such as radar technology to observe earth’s surface were developed and volume of ecological studies further increased. In 1980s, scientific evidences identified potential consequence of climate change, ozone depletion and loss of biodiversity. These global issues were linked to local issues such as loss of land cover, loss of biodiversity, increase in greenhouse gas emission, air pollution, and use of harmful substances. From 1972 onwards major agreements were made relating to trans-boundary pollution, global pollution, and control of emission. Between 1980 and 1990, New UN Convention on the Law of the Sea is signed by 117 States, European nations begin ban on ozone – depleting chemicals after the discovery of ozone hole over Antartica in 1985, which was confirmed by US NASA satellite monitoring. In 1989, Exxon Valdez oil oil tanker ran aground in Prince William Sound, Alaska, spilling 11 million gallons. In the same year Greenpeace reported accidents involving US and Russian ship, which had left at least 50 nuclear warheads and nine nuclear reactors on the ocean floors since 1956. From 1985 to 1992, a rapid development of international law was witnessed. During that period many global agreements were negotiated. These include the Vienna Convention on the Protection of the Ozone Layer; the Montreal Protocol on Substances that Deplete the Ozone Layer with the London Adjustments and Amendments, the Protocol on Environmental Protection (with annexes) to the Antarctic Treaty. In 1992 a fundamental breakthrough had happened in international arena by the United Nations Conference on Environment and Development in Rio de Janeiro in 1992 (UNCED), which was attended by 176 states and several thousand nongovernmental organizations. UNECD was concerned to bring a balance between environmental protection and economic development. The Rio Conference adopted two legally binding treaties the Convention on Biological Diversity and the Framework Convention on Climate Change, and three nonbinding instruments, the Rio Declaration, the Principles on Forests, and the AGENDA 21. The international agreements negotiated in last 20 years mostly reflect commonality of global interests in maintaining the robustness and integrity of our planets and set up procedures through monitoring the health of environment and provide benefits to all parties. However, there are quite a lot of differences among states while allocating the burdens and benefits, which were identified at the Rio Conference meetings. It is expected that the international legal instrument will continue to become diverse and will continue to adopt new approaches, procedures and duties in international environmental accords.